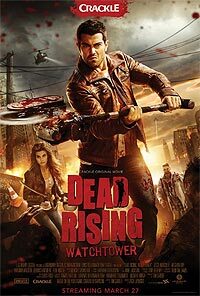 Dead Rising: Watchtower (2015) - Sci-fi-central.com. USA  2015  118m   Directed by: Zach Lipovsky.  Starring: Jesse Metcalfe, Meghan Ory, Virginia Madsen, Keegan Connor Tracy, Aleks Paunovic, Dennis Haysbert, Gary Jones, Carrie Genzel, Rob Riggle, Reese Alexander, Harley Morenstein, Julia Benson, Peter Benson.  Music by: Oleksa Lozowchuk. Dead Rising Watch Tower is set five years after the Fortune City Outbreak of Dead Rising 2 and bridges the events between Dead Rising 2 and 3. During the outbreak at essentially anywhere USA, we see journalist Chase Carter team up with survivors Crystal O'Rourke, Maggie, and Jordan to uncover the conspiracy behind the outbreak, while trying to survive. Well they would if zombies didn't only show up when necessary leaving the streets bare the rest of the time. If you are familiar with the Dead Rising series then you know what you should expect for a story. Survivors attempting to survive while uncover another segment of an over arching conspiracy behind the zombie outbreak. This time revolving a bad batch of the anti zombie medication Zombrex. At first the conspiracy works and makes sense, but by the end act so many leaps of faith are taken that one has to ask if this was their plan or an act of convenience, with neither answer resolving all questions ether scenario raise. As no rational minded person would ever expect the heroes in a town over ran by zombies to make it to the exact warehouse or be able to uncover that the drugs are bad in the phenomenal way that they eventually do. In between these large stretches improbabilities we are treated to a wonderful cast of survivors and psychos. Each, from the psychos to the heroes are well flushed out with delivery of their back stories often better than in movies with higher budgets. Perhaps this element is aided by the production values of the movie, leaving it with a more personal down to earth feeling that big budget movies often struggle to capture. Acting overall decent for the movie, the General played by Dennis Haysbert and the psychos deliver some memorable and well acted scenes to counter balance the more forgettable scenes from the main characters. Virginia Madsen delivers a memorable back story and death scene, but is overplayed in the ending while manages to make for a better zombie than some of the background actors. Of course we have to talk about Frank West played by Rob Riggle. He entirely fails to capture the essence of Frank West. For those unaffiliated with the video game series, Frank West is a famous investigative reporter who went into the first US outbreak at Willamette, uncovered the truth behind the zombie outbreak, fought and survived the military's special forces, became famous and later went out to help Chuck Green clear his name while discovering Phenotrans was behind several outbreaks to collect parasitic wasps (the source of the infection even though the movie erroneously keeps calling it a virus) for Zombrex. In Watch Tower he is stripped of all his wit, his charm, and made into a joke. His scenes are meant to be funny comedic relief, but just feel like slandering of a great icon of the series. Often sounding more like an air head than the veteran of several zombie outbreaks and the series icon that he is. Effects in the movie vary from surprisingly good to overplayed, to comically standing out CGI. I had to admire the zombies eyes, and the damage to the bodies from weapons when shown directly, most often the damage is done away from the camera, since this is a budgeted movie. You'll never really be bothered by this. It works for Watch Tower. There is a particularly bone headed stunt pulled near the end of the movie that practically undoes a massive amount of sympathy you'll have garnered for the characters. A person on Zombrex bites a villain claiming he is then infected, of course he deserved it, but that raises the issue that Zombrex doesn't stop these people from spreading the parasites (against the infection is not cause by a virus) with a person on Zombrex biting someone claiming he is now infected. That one money undermines every ounce of sympathy for the characters back story. If that is the case then contact with anyone infected could result in being turned into a zombie, your fiancée leaving you because he could turn into a zombie through sexual contact or through any number of accidents becomes entirely understandable, even extraordinarily reasonable if not all but expected, since you are no longer a victim afflicted through no fault of your own, but a carrier capable of turning anyone and everyone into a zombie, ruining lives everywhere. Of course the better and easier thing to do is to just assume she is full of it with this scene, given that the government wouldn't let anyone walk around Zombrex or no if this was even remotely possible. Past that boneheaded scene, the movie is very trope filled. Zombies will only move as fast as the circumstances dictate, they are also as intelligent as the circumstances dictate. Whomever wrote the script was obviously entirely unaware of how zombies functioned in the Dead Rising universe, so don't expect the glowing red eyes at night that is a staple of the series or consistency for that matter. Characters won't kill other characters when it is obvious they should, and people become stupid at several points to justify the heroes survival. The tropes aren't constant, often times the movie avoids them giving surprising air of intelligence to the genre. More towards the ending the movie opts to use them excessively. Don't expect this movie to surprise you, the plot is entirely predictable, the effects passable, the acting acceptable, it's a B- Movie Zombie flick. If you are a fan of the series, the movie will probably disappoint you, even with its cameos and staple zaniness, but if you looking for a good B-Movie Zombie flick with some freshness to it you'll enjoy this movie. Review by Phasmatis75 from the Internet Movie Database.